Heavy smoke billows the air due to clashes between supporters of Egypt’s ousted Islamist President Mohamed Morsi and security forces in Mediterranean city of Alexandria, Egypt, Friday,(Photo: AP). Egypt witnessed a day of violent clashes between supporters of the Muslim Brotherhood and the police at a level unparalleled in more than two months. The ministry of health said on Saturday that 14 people were killed and 62 injured in clashes across the country on Friday. Earlier on Saturday, a medical source had told Al-Ahram 17 people were killed during the clashes. 17 police officers were also injured, according to a senior security source. Protesters died in Cairo, Alexandria, the Suez Canal city of Ismailia, Fayoum and Minya in Upper Egypt, according to the Egyptian health ministry. The police said it arrested more than 258 Brotherhood supporters including some possessing explosives and weapons. 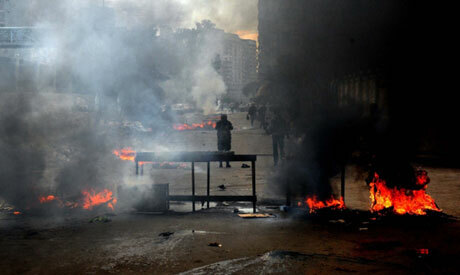 Clashes continued into the night east of the capital at Gisr El-Suez Street and at the other end of the city's outskirts at Al-Talbiya area near the pyramids, where burning tires, tear gas and stone throwing painted scenes on Egyptian television channels. Confrontations took place in many other locations around the capital, but police managed to disperse them more effectively. In Nasr City – which had calmed down amid a heavy police presence, according to Al-Ahram's Arabic news website – a public bus was smashed and several cars were shattered in the violence. Police fired teargas at a student march at the nearby Al-Azhar University, a major scene of Islamist protests in recent weeks, state news agency MENA said. The more people that die - the more angry the populace and the harder they will be to control - It's unfortunate that the Egyptians can't seem to get this logic - I dont forsee anything else but more and more civil strife in the country - you kill people you provoke the people's anger - no matter what side you are on - you just dont continue killing and killing- this vicious cycle will only leave the Egyptian people undone and Egypt less of a country than it was in the past..think people think..
Reading some talkbacks it look likes I,m Reading Jpost comments. Closing all critical media, removing critical voices and pointing at State news as so called prove is outrages . Farid, you share the same name, but Reading your comments there I see little diference between you and zionists who have hatred against muslims in their DNA like people like allen are showing here. Last week HRW and WH were questioning decision of Egyptian Government which puts MB's as terrorist organisation. HRW and WH were asking to prove this stance, as I see above, here it is: "a public bus was smashed and several cars were shattered in the violence"... "Brotherhood supporters set the Faculty of Agriculture building at Al-Azhar University on fire and damaged five administrative offices inside" ... "some 300 pro-Brotherhood protesters blocked off Cairo's corniche road near the High Administrative Court in the southern suburb of Maadi. Protesters responded with stone-throwing" ... "Eyewitnesses told Al-Ahram on Friday morning that protesters in the Giza's Faysal district had thrown Molotov cocktails at an armoured police vehicle, setting it on fire, and shot at police officers trying to escape from the car" ... "hundreds of Islamists clashed with civilian opponents, using stones and birdshot" ... "Egypt's interior ministry said in a statement on Friday afternoon it had arrested 120 Brotherhood members nationwide, and said they were armed with explosives, Molotov coctails, firearms and knives". DO YOU NEED MORE PROOF??? Sam, Obama says little because he (as figurehead of the US State Department) supports the de-stabilization of Egypt, as well has his pet mercenaries, the Muslim Brotherhood. Though I do not like Muslim Brotherhood or any religious based organisation, as an outsider, what is being done to Muslim Brotherhood is wrong and injustice. The people have elected Morsi no matter how narrow the victory is. In fact he had much better margin than Gorge Bush Junior’s election. So he should have been left to finish his term. Of course he is stupid and made so many mistakes too early like failing to put his people in the army and make himself clown by broadcasting his security meeting live on air calling the US the enemy that he planning to fight, financing terrorist organization in Eritrea and declaring war on Syria. Nevertheless there is no justification for his removal. Now the road to democracy has been blocked for at list one generation. So many killing has been taking place and the army fear that they will be prosecuted if they handover power. So for their own protection they will continue to use power to crash everyone and cling to power. The army will be the new dictator as it has been for many years and the liberals as well as the MB will be crashed under the boots of the army sending Egypt backwards economically and culturally. It is only reconciliation between the brotherhood and the liberals that can challenge the army and drive Egypt back to democracy. Some sort of transitional government between the liberals and MB need to be set-up. The MB is an anti civil rights, neo-nazi, clerical fascist mercenary organization, anathema to the checks and balances that exist in the US. In no way is it 'wrong' or 'unjust' for a government to eradicate these outside-funded destabilization groups. By portraying them as oppressed, you effectively serve as cheerleader for their EU/US sponsors. Now it is, "Why doesn't Obama say anything about this." Funny, sime 30 June, all I have heard is that he should not comment on Egypt's internal affairs. Please make up your mind. Read your own press. One day it is Obama supports The Brothers. The next, The Brothers claim he supports Sisi. Maybe the mess Egypt is in was cause by Egyptians. Tunisians are a million times better??? Tunisian Islamists are million times better than these military Nazis. Its time that Egypt get rid of all the violent people who want to control country by force , because violence will always generate more violence. The Muslim Brotherhood criminals have obviously gone rabid, and won't likely come to their senses unless they face urgent trials and get more deterrent sentences including the death penalty.